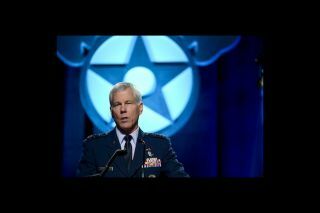 Air Force Gen. William Shelton. The U.S. Air Force plans to launch two space surveillance spacecraft into high-altitude orbits later this year to monitor satellite traffic in the congested geosynchronous belt 22,300 miles above Earth, the head of Space Command has announced. The previously classified program will help the Air Force track man-made orbiting objects in high-altitude orbits, a region populated by the military's strategic communications and early warning satellites. The capabilities of existing space surveillance assets on the ground and in orbit a few hundred miles above Earth are limited in detecting satellite movements at higher altitudes, according to military officials. "GSSAP will produce a significant improvement in space object surveillance, not only for better collision avoidance but also for detecting threats," Shelton said in a speech at the Air Warfare Symposium in Orlando, Fla. "GSSAP will bolster our ability to discern when adversaries attempt to avoid detection and to discover capabilities they may have which might be harmful to our critical assets at these higher altitudes." The service published a fact sheet on the program in conjunction with Shelton's announcement. According to the fact sheet, the surveillance project's primary contractor is Orbital Sciences Corp. The GSSAP program's budget and details of the satellites were not released. The Air Force's Space Based Space Surveillance, or SBSS, satellite launched in 2010 with an optical telescope to peer at spacecraft in geosynchronous orbit. But SBSS flies in low Earth orbit about 300 miles high, putting it thousands of miles away from its observational targets. The GSSAP satellites will be much closer, but the Air Force has not said how close. "As other nations show their commitment in investing in systems capable of harming our satellites, we are committed to investing in space surveillance assets like GSSAP that will directly enable safe operations, protect our spacecraft, and indirectly enable a range of decisive responses that will enable counterspace threats ineffective," Shelton said. The Air Force says the satellites will operate in a "near-geosynchronous orbit regime" and "will have a clear, unobstructed and distinct vantage point for viewing resident space objects orbiting earth in a near-geosynchronous orbit without the disruption of weather or atmosphere that can limit ground-based systems." Spacecraft positioned 22,300 miles over the equator appear to hover over a fixed location on Earth because their speed matches the rate of the planet's rotation. Geosynchronous orbits are popular with commercial and military communications satellite operators. Carrying electro-optical imaging sensors to locate other objects, the GSSAP satellites could drift around the geosynchronous belt to inspect other spacecraft with ease. It takes relatively little propellant to maneuver around geosynchronous orbit, where satellites are tightly clustered in a narrow band directly above the equator. GSSAP "will uniquely contribute to timely and accurate orbital predictions, enhancing our knowledge of the geosynchronous orbit environment, and further enabling space flight safety to include satellite collision avoidance," explains the Air Force's fact sheet. The space surveillance satellites will launch from Cape Canaveral on a United Launch Alliance Delta 4 rocket in late 2014, Shelton said. The launch was scheduled for this month but moved to the end of the year behind three Delta 4 launches with a pair of GPS navigation payloads and the first orbital test flight of NASA's Orion crew exploration vehicle. The reasons for the delay were not disclosed. Another pair of GSSAP satellites are scheduled to lift off in 2016. Controllers with the Air Force's 50th Space Wing at Schriever Air Force Base, Colo., will oversee commanding of the GSSAP satellites, according to the program's fact sheet. The launcher's main payloads were previously kept secret by the Air Force. The flight is listed on the Delta 4 manifest as the "Air Force Space Command-4" mission. An Air Force spokesperson told Spaceflight Now last year the Air Force Space Command-4 launch's destination was geosynchronous orbit, indicating the Delta 4 would directly inject its payloads into a near-circular orbit near the satellites' final operating locations. The military previously acknowledged a secondary passenger on the Delta 4 flight as a technology demonstration satellite known as ANGELS, which stands for Automated Navigation and Guidance Experiment for Local Space. Like the pair of larger geosynchronous space surveillance platforms, the ANGELS microsatellite is equipped with instrumentation to detect, track and identify other spacecraft in orbit. Orbital Sciences is also leading construction of the ANGELS spacecraft after winning a competition with Lockheed Martin Corp. to build the satellite. Orbital Sciences and Lockheed Martin have experience in the space surveillance realm. The companies teamed up to supply two satellites to the Defense Advanced Research Projects Agency, or DARPA, the Pentagon's research and development division, for a mysterious technology demonstration mission named MiTEx launched in 2006. The washing machine-sized MiTEx satellites roamed geosynchronous orbit for at least several years, including a visit to a failed U.S. Air Force missile warning satellite for an unprecedented close-up inspection. Lockheed Martin also led industrial development of the Air Force's experimental XSS-11 mission, a predecessor to ANGELS. XSS-11 tried out autonomous rendezvous and inspection techniques in low Earth orbit a few hundred miles up. ANGELS will test accelerometers and modified algorithms to use GPS navigation signals for precise guidance in close proximity to other satellites, reducing the probability of a collision, according to the Air Force. Developed by NASA, the advanced GPS algorithms will allow the ANGELS spacecraft to use navigation data from GPS satellites flying below geosynchronous altitude. Managed by the Air Force Research Laboratory's Space Vehicles Directorate, ANGELS will do a similar job as XSS-11 in a much higher orbit, autonomously maneuvering around the upper stage of the Delta 4 rocket after the launcher completes its mission. An Air Force fact sheet says the scope of the ANGELS mission is limited to operations in the space around the Delta 4 upper stage.